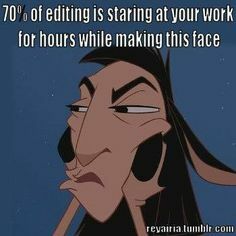 More like the never-ending process of editing. And I’m not talking a manuscript here, I’m talking about my blog posts. It seems that I am constantly or maybe I ‘should’ write, consistently, editing my posts. Every time I find myself re-reading one I find an errant word, or grammatical mistake, that I must correct right then. Mind you, the reason I’m looking at the post again in the first place is because it’s garnered another read which then prompts me to want to re-read it in hopes of seeing it as a new reader might have. It galls me to then notice the mistakes. It also drives me to then scroll though other posts, you know…just in case. Granted, it’s a situation where I’m “closing the barn door after the horse has escaped” but I can’t help it. If I see an error, I must fix it. And this happens no matter how old the post is. I try to do a decent edit before I hit “publish”. I’ll preview a post at least three times before I turn it loose on an unsuspecting blogosphere, but every once in a while, a mistake (or three) slips through and the next day when I’m obsessively…uh, I mean, diligently checking my stats, if that post has been read, I’ll pop back to read it. Cursor hovering over the “edit” button so I can quickly pop over and fix any goof-ups I find. I swear, some of these posts have been edited / revised so many times it’s a wonder they haven’t popped up as brand new posts altogether.